By "really don't have" I mean like beard, beard....beard. WARNING! THIS POST IS FILLED WITH OPINIONS! I know that the Supernovas is considered a no-no, but goddamn, Capone Bege! Just think about it: aside from Bonney, he is widely considered the weakest supernova, so perhaps he could have his crew annihilated and then turn to the sh crew, and join them. Looking at his traits, i think that he could really fit in. He seems to be a bit older than the rest of the gang (exept Brook, of course), maybe about 40 years or someting. His body-type is also uniqe. The sh crew doesnt have a chubby guy yet (or well, Jinbe and chopper in kung-fu point) and he seems pretty short, only taller than chopper perhaps? I could se him beeing a bit sarcastic, perhaps even mean, wich would result in funny interactions between him and Robin. Luffy, Chopper and Ussop would admire his powers, Franky could help him load his body with new weapons, and Brook could have adault conversations with him (no, not that kind of adault. we have Sanji for that). And he would actually be knowledgeable about the new world unlike the rest of the crew, wich they all could benefit from. But then comes the big question: who would operate the cannons and such from inside his body, if his crew were gone? Perhaps Robin could, with her powers, or maybe Franky fixes him up with automatic cannons and sh#t, but both seems unlikely. And on top of that, his powers would be a bit to simmilar with Frankys. But disregarding his powers, he could really fit in. But so would a lot of people. i dunno lol. If we only have two spots left, I'm putting it all on Bon-chan. 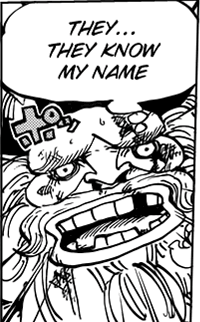 Using this logic, we can infer that the next chosen Strawhat will have a name with a different first letter than those currently on the crew. That makes options such as Jinbe and Monet possible, but others like Baby 5 less likely (unless you refer to her as '5', with which it's anybody's guess). I know I'm pulling this out of my bum, but this is the kind of OCD thing Oda would do, so we'll have to wait and see to find out. Yeah I doubt her real name is Baby 5, also 26 strawhats!!!! one for each of the letters!!!!!!!!!!!!! Capone's chances died the moment he took down his nakama with a fork for some trivial reasons. Also known as the moment he was introduced. Ok, so obviously Jinbe is a given. He stated he was joining in the previous arc. Now contrary to what others think, i feel as if he is going to join much sooner than the big mam arc. Im not sure how this "DressRosa" arc is going to flow or what-not, but he was purposely postponed for a certain reason. Jinbe's crew was completely missing from the island, and obviously there is going to be huge implications to how that unfolds. There's also the issue with Big Mam on that, but at that point im sure he'll already have decided. So obviously Jinbe will 1000% join the crew, just he is definitely not the next crew mate. Next we have Kinemon. I honestly do not mind another swordsman in the crew, plus he's just so quirky enough that it works. Wiper didn't join because of how serious he was, and the fact he wasn't built to b weird anyway. His fighting style is unique but questions me as Zoro is interested in the style, leaving room for progression on him. We'll just have to see how this long stretch of Arcs unfold, as definitely he, and his son will be temporarily on the straw hats boat by the end of this. Now Monet. I really dont get why people say she gives off the Robin vibe. She isnt really a negative person, she also likes to say playful comments towards people she's affiliated with. Now the most important thing is her power. It already has been sort of stated/confirmed, that she is a shapeshifter or can somehow create objects or things of that sort. She also gave the vibe that if she fail her mission, Dofla will kill her, which totally sets her up for Luffy solving her problems. We need a female like her, but we'll see as this plays out, not just the arc, but the whole DressRosa arc. Momonosuke only has my attention because of strawhats dire need for a pet. If Momonosuke isnt permanently a Dragon, then i want a real dragon. What better pet than a damn dragon lol. Aokiji...not much to say here. We need a damn logia. Maybe it wont be him because him and brooks powers kind of clash now, but we need an awesome logia in the crew, maybe some sort of earth or ground logia?? And People shouldnt argue that Kinemon and Monet both cannot join because they were both introduced in the same arc or whatnot. Robin was introduced, then Chopper came out of nowhere, we all though Vivi was going to join, then Robin joins. Kinemon could "officially" join in the Wano Country arc and Monet after Dofla is raped by Luffy. Jinbe after an arc with his "crew" concluded. I would say a dragon as a pet after this one. People saying not to many people should join are misunderstanding the fact that now more than ever, there needs to be increase in crew members. The straw hat crew cannot stay a 9 man crew forever, and this is when it should be team building (especially since i still feel as if this manga isnt even half way done) now before things get really hectic. I know im just a crazy fan, but i want more crew members, and I know oda can handle each's screen time. He's doing it masterfully with 9 members plus law, kinemon, monet, CC, Smoker, Tashigi, Vergo, and even outside crews and alliances. A 12 to 14 member crew is not impossible. In any case I more than sure we'll see at least more than 10, disproving luffy's little wish of 10 crew members in the beginning of the manga. He wanted 10 before he got into grand line. He has 8 by the end of "paradise". So in the end i would love for Kinemon and Monet to join, but i understand the reality of things, because i wanted bon clay to join as well and he's really unique lmao. Remember that Franky's real name is "Cutty Flam"
I'm referring to the names they use in everyday conversation. I mean, Robin is actually Nico Robin, but everybody refers to her as just Robin. Nico is her family name. Like Monkey D. Luffy or Roronoa Zoro. The crew will have 11 people (including Luffy), sticking to what he said at the start. I'm thinking one person will join the crew at the start of the New World and one at the end. Jinbe has a good chance, but Oda would not delay his joining without substantial story reasons, I think something will happen which prevents him from joining (crazy but I think he could die in the fight against Big Mam). The other crewmate will probably be a new character that we haven't met at this stage, though I'd like it to be Bonney. I hope Oda keep's his promise about 10(excluding Luffy), since he remembered something from chapter 1, I'm sure he can remember this. Why are people under the impression that the StrawHats need various things? Just because there are no logias or pets doesn't mean that they are desperately needed. If they need something it will be mentioned, like needing a shipwright or their ship would sink. Also the argument of needing a new girl really makes no sense. They already have, per capita, more girls than almost any other group. Lol wow way to quote-bite. I didnt mean it as if they were going to be dead if they're werent more crew members. The Straw Hat crew does feel like a small time crew, but I still cannot see them becoming truly menacing without at least a few more characters. The cover of vol. 64 is one of my favorite covers because it shows the potential on the growth of that crew. Vol. 52 has all 9 of them on the cover, but the addition of Jinbe and them in battle mode on 64 really made them feel menacing. Coupled with a few more unique characters, while the manga is chock full of it as well as the crew, the Straw hat crew at 12ish crew members would look fantastic. Thats all I meant, Honestly if this crew count stayed this way to the end of the manga then I would still love it. Okay, when the hell did she become an astronomer? I was thinking the same thing..